The Supreme Court today upheld the constitutional validity of the Insolvency and Bankruptcy Code 2016 in its "entirety". The Court however held that to attract the bar under Section 29A from participating in resolution process, "related person" should be a person connected to the defaulting entity. The bench of Justices R F Nariman and Navin Sinha had reserved orders on January 15 on the petitions challenging the validity of IBC. The bunch of petitions were moved primarily contending that IBC was discriminatory and unfair to operational creditors as compared to financial creditors. The apex court had transferred to it similar petitions filed in various High Courts. 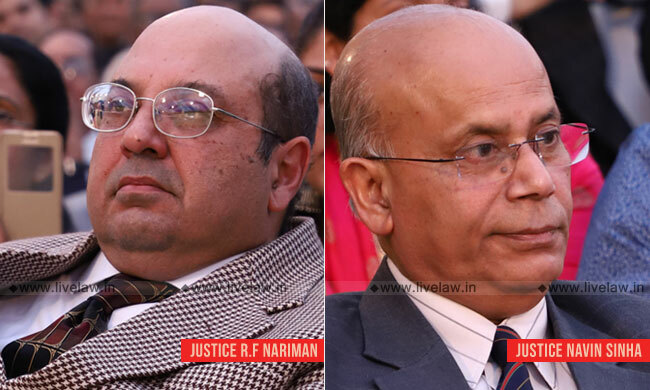 During the hearing, Justice Nariman had expressed the need to have circuit benches of NCLAT in metros. From the batch of petitions challenging IBC, the bench had split up the petitions challenging the circular issued by RBI on February 12, which had directed lenders to initiate IBC proceedings against defaulters in the sectors of power, steel and textiles.Private power companies challenged the circular saying it is ultra vires the RBI Act as it affected banks' discretion to decide on the action against non performing assets. The Court said that challenge to RBI Circular will be dealt with separately. Referring to the code, the bench explained the difference between Financial Creditor and operational Creditor. It said: "A perusal of the definition of financial creditor and financial debt makes it clear that a financial debt is a debt together with interest, if any, which is disbursed against the consideration for time value of money. It may further be money that is borrowed or raised in any of the manners prescribed in Section 5(8) or otherwise, as Section 5(8) is an inclusive definition. On the other hand, and 'operational debt' would include a claim in respect of the provision of goods or services, including employment, or a debt in respect of payment of dues arising under any law and payable to the Government or any local authority." Most financial creditors, particularly banks and financial institutions, are secured creditors whereas most operational creditors are unsecured, payments for goods and services as well as payments to workers not being secured by mortgaged documents and the like. Financial contracts generally involve large sums of money. By way of contrast, operational contracts have dues whose quantum is generally less. In the running of a business, operational creditors can be many as opposed to financial creditors, who lend finance for the set up or working of business. Financial creditors have specified repayment schedules, and defaults entitle financial creditors to recall a loan in totality. Contracts with operational creditors do not have any such stipulations. The forum in which dispute resolution takes place is completely different. Contracts with operational creditors can and do have arbitration clauses where dispute resolution is done privately. Operational debts also tend to be recurring in nature and the possibility of genuine disputes in case of operational debts is much higher when compared to financial debts. A simple example will suffice. Goods that are supplied may be substandard. Services that are provided may be substandard. Goods may not have been supplied at all. All these qua operational debts are matters to be proved in arbitration or in the courts of law. On the other hand, financial debts made to banks and financial institutions are well-documented and defaults made are easily verifiable. Financial creditors are, from the very beginning, involved with assessing the viability of the corporate debtor. They can, and therefore do, engage in restructuring of the loan as well as 66 reorganization of the corporate debtor's business when there is financial stress, which are things operational creditors do not and cannot do. Whereas a 'claim' gives rise to a 'debt' only when it becomes 'due', a 'default' occurs only when a 'debt' becomes 'due' and 'payable' and is not paid by the debtor. It is for this reason that a financial creditor has to prove 'default' as opposed to an operational creditor who merely 'claims' a right to payment of a liability or obligation in respect of a debt which may be due. When this aspect is borne in mind, the differentiation in the triggering of insolvency resolution process by financial creditors under Section 7 and by operational creditors under Sections 8 and 9 of the Code becomes clear. While upholding this section, the bench said: "The main thrust against the provision of Section 12A is the fact that ninety per cent of the committee of creditors has to allow withdrawal. This high threshold has been explained in the ILC Report as all financial creditors have to put their heads together to allow such withdrawal as, ordinarily, an omnibus settlement involving all creditors ought, ideally, to be entered into. This explains why ninety per cent, which is substantially all the financial creditors, have to grant their approval to an individual withdrawal or settlement. In any case, the figure of ninety per cent, in the absence of anything further to show that it is arbitrary, must pertain to the domain of legislative policy, which has been explained by the Report (supra). Also, it is clear, that under Section 60 of the Code, the committee of creditors do not have the last word on the subject. If the committee of creditors arbitrarily 102 rejects a just settlement and/or withdrawal claim, the NCLT, and thereafter, the NCLAT can always set aside such decision under Section 60 of the Code. For all these reasons, we are of the view that Section 12A also passes constitutional muster." Resolution professional has no adjudicatory powers. The bench observed that, under the Code, the resolution professional is given administrative as opposed to quasi-judicial powers. It added that, even when the resolution professional is to make a 'determination' under Regulation 35A, he is only to apply to the Adjudicating Authority for appropriate relief based on the determination. It said: "Unlike the liquidator, the resolution professional cannot act in a number of matters without the approval of the committee of creditors under Section 28 of the Code, which can, by a two-thirds majority, replace one resolution professional with another, in case they are unhappy with his performance. Thus, the resolution professional is really a facilitator of the resolution process, whose administrative functions are overseen by the committee of creditors and by the Adjudicating Authority." The challenge against Section 29A of the Code, which deals with eligibility of persons to be a resolution applicant, has been dealt with elaborately in this judgment. The bench referred to the judgment in ArcelorMittal, in which it had held that resolution applicants have no vested right to be considered as such in the resolution process. The contention raised by the petitioners was that the Section 29A(c) treats unequals as equals and that a good erstwhile manager cannot be lumped with a bad erstwhile manager. According to them, keeping out good erstwhile managers from the resolution process would go contrary to this objective. Rejecting this argument, the bench said that this ineligibility is not restricted to malfeasance. It said: "Even the categories of persons who are ineligible under Section 29A, which includes persons who are malfeasant, or persons who have fallen foul of the law in some way, and persons who are unable to pay their debts in the grace period allowed, are further, by this proviso, interdicted from purchasing assets of the corporate debtor whose debts they have either wilfully not paid or have been unable to pay. The legislative purpose which permeates Section 29A continues to permeate the Section when it applies not merely to resolution applicants, but to liquidation also. Consequently, this plea is also rejected." The court also observed that the one-year period in section 29A(c) cannot be faulted with as it is a policy matter decided by the RBI. The judgment only makes some intervention in the interpretation of Section 29A(j) which defines 'related party'. The court dealt with the contention that, mere fact that somebody happens to be a relative of an ineligible person cannot be good enough to oust such person from becoming a resolution applicant, if he is otherwise qualified. The court held that, in the absence of showing that such a 'related person' is connected with the business of the activity of the resolution applicant, such person cannot possibly be disqualified under Section 29A(j). "We are of the view that persons who act jointly or in concert with others are connected with the business activity of the resolution applicant. Similarly, all the categories of persons mentioned in Section 5(24A) show that such persons must be 'connected' with the resolution applicant within the meaning of Section 29A(j). This being the case, the said categories of persons who are collectively mentioned under the caption 'relative' obviously need to have a connection with the business activity of the resolution applicant. In the absence of showing that such person is 'connected' with the business of the activity of the resolution applicant, such person cannot possibly be disqualified under Section 29A(j). All the categories in Section 29A(j) deal with persons, natural as well as artificial, who are connected with the business activity of the resolution applicant. The expression 'related party', therefore, and 'relative' contained in the definition Sections must be read noscitur a sociis with the categories of persons mentioned in Explanation I, and so read, would include only persons who are connected with the business activity of the resolution applicant. ", the bench said. The bench also observed that the rationale for excluding such industries from the eligibility criteria laid down in Section 29A(c) and 29A(h) is because qua such industries, other resolution applicants may not be forthcoming, which then will inevitably lead not to resolution, but to liquidation. The court said: "It will be seen that the reason for differentiating between financial debts, which are secured, and operational debts, which are unsecured, is in the relative importance of the two types of debts when it comes to the object sought to be achieved by the Insolvency Code. We have already seen that repayment of financial debts infuses capital into the economy inasmuch as banks and financial institutions are able, with the money that has been paid back, to further lend such money to other entrepreneurs for their businesses. This rationale creates an intelligible differentia between financial debts and operational debts, 148 which are unsecured, which is directly related to the object sought to be achieved by the Code. In any case, workmen's dues, which are also unsecured debts, have traditionally been placed above most other debts. Thus, it can be seen that unsecured debts are of various kinds, and so long as there is some legitimate interest sought to be protected, having relation to the object sought to be achieved by the statute in question, Article 14 does not get infracted."